The boulder shown above, about 60 cm long, fell from a cliff that was carved into the edge of a steep fold by moving glacial ice. 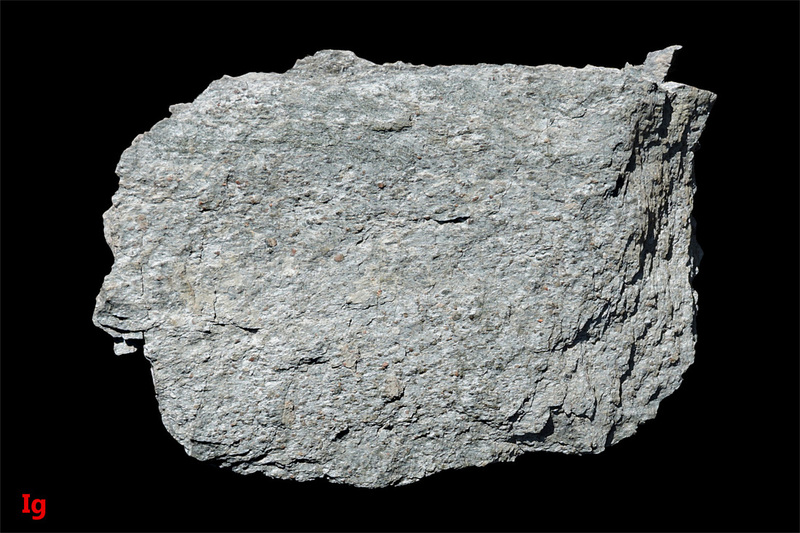 The near-schistose texture of the rock resulted from shear stress associated with the folding. 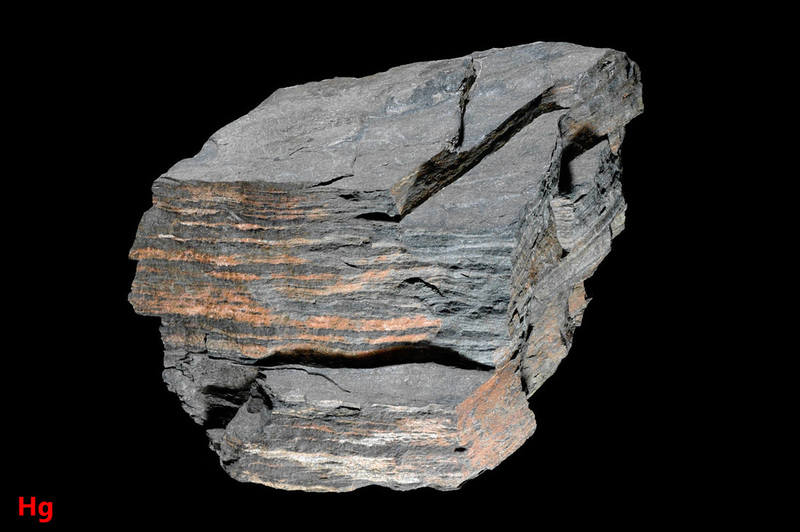 This rock, a phyllosilicate-based fine grained sedimentary rock, was sandwiched between more resistant layers and therefore accommodated a disproportionate share of the strain as tectonic pressure forced flat layers of rock into a curved configuration. Shear stress can create planes of weakness when rocks exposed to shear stress undergo fracture and then slip along the fracture plane, thereby relieving the stress. This is a brittle mode of failure and the resulting planes of weakness are faults rather than joints. The effects on geomorphology of shear fracture vs. jointing may not be noticeable where there is not much motion on the faults. 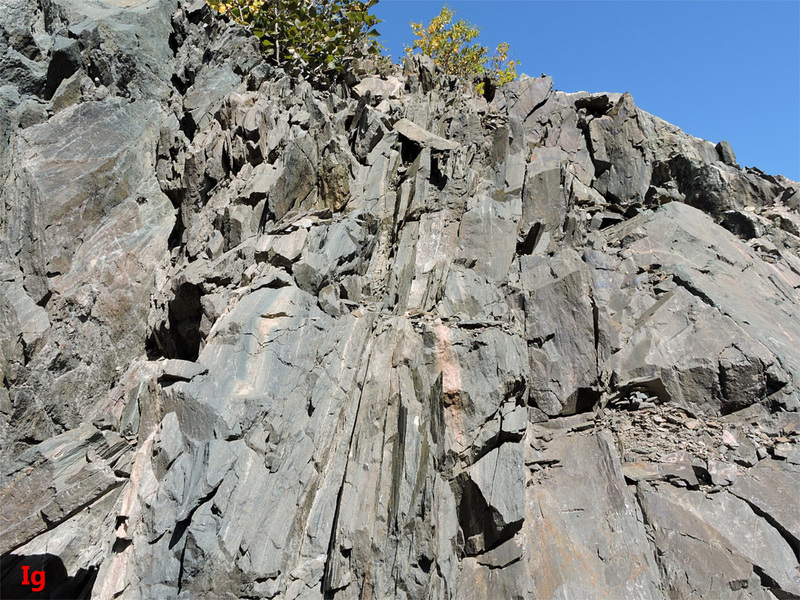 A feature known as a slickenside can form when two rock surfaces slide against each other, leaving linear scratches or grooves on each surface from the mutual abrasion. Observation of a slickenside provides evidence of motion on a fault. Shear fractures can form in any type of rock, given sufficient shear stress, and corresponding planes of weakness do not depend on crystal grain alignment or the presence of phyllosilicate minerals. When phyllosilicates are present, shear stress can be accommodated by the alignment of crystal grains. The aligned grains will then relieve stress by deforming in their preferred crystallographic direction. This type of rock failure is ductile more so than brittle, and will leave the deformed rock with highly aligned grains and a schistose or intensely layered texture. Hydrostatic stress (depth of burial) and higher temperatures favor ductile failure. 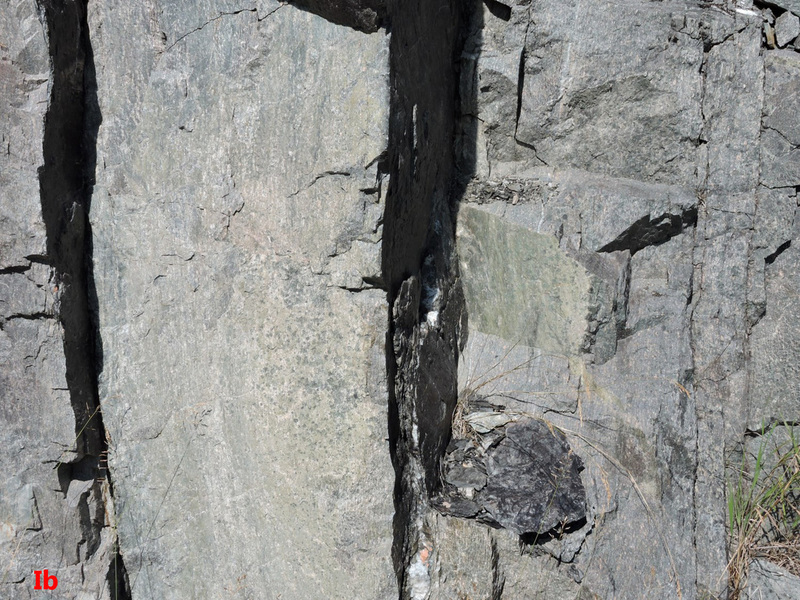 Joints can form readily when rocks, having undergone ductile shear strain, are subsequently exposed to tensile stress. A slickenside in black marine siltstone is shown above, left. 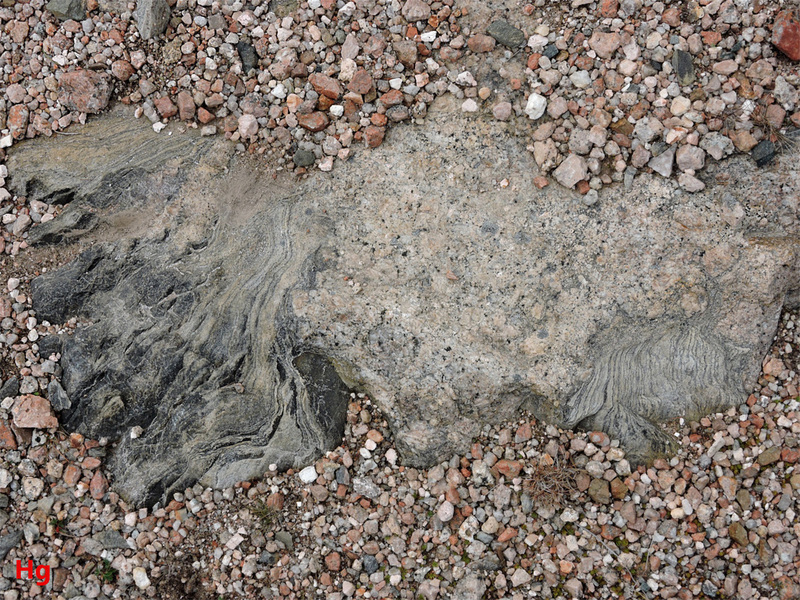 This rock specimen (14 cm, longest dimension) was taken from a fault exposed by glacial erosion on the side of a folded landform. 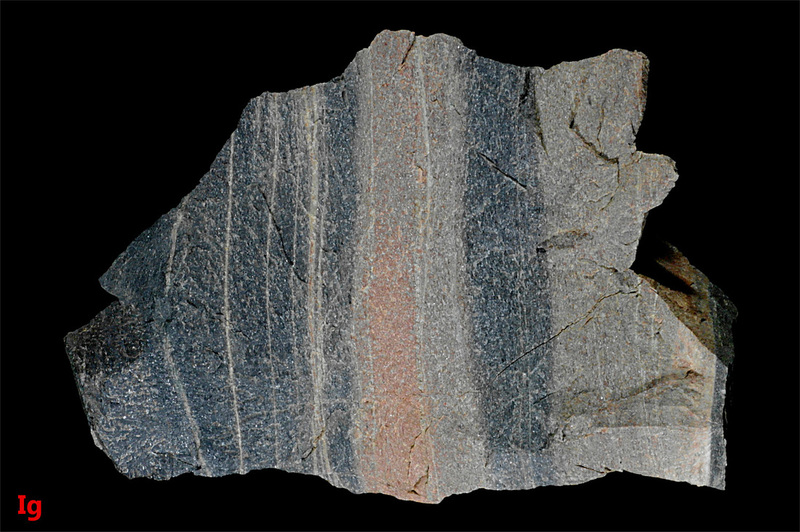 The rock above and below the fault showed distinct jointing and the back side of this specimen is a joint surface, parallel to the fault surface shown. The joints in the neighborhood of the fault appear to be the result of shear-induced grain alignment or weaknesses between bedding planes. The illustrated surface parallels bedding in the rock. The absence of marks on the planes of the joints above and below the fault indicates little movement on these planes. The view seen above is very near, or directly on, a ductile shear zone of the Dover fault. Heart of Avalonia rocks lie to the right, Gander zone rocks to the left. 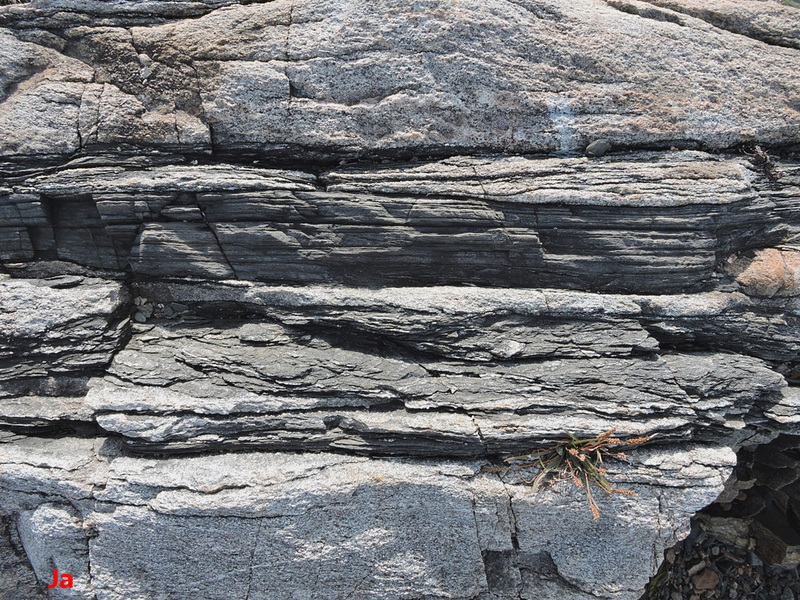 Although compressional tectonic stress existed at this location, the jointing apparent in the photo is entirely due to shear stress and consequent large-scale shear deformation of the rocks. 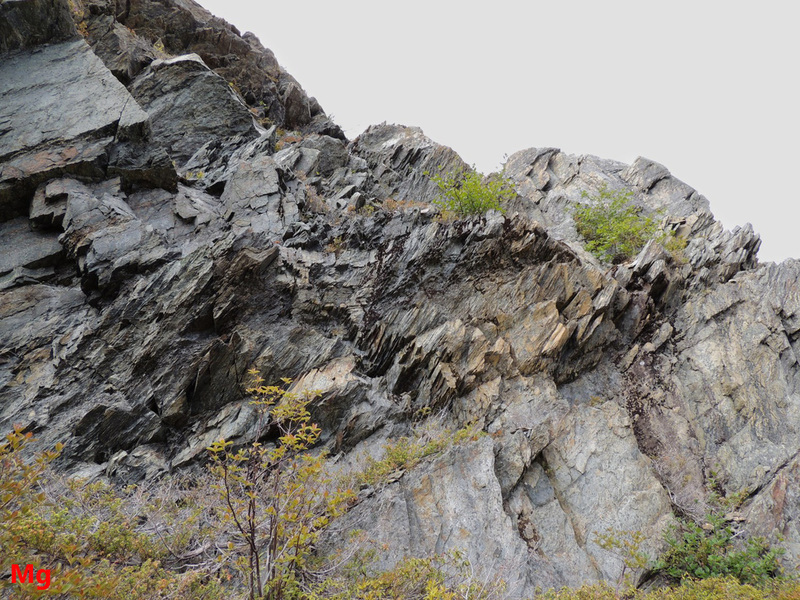 The Dover fault was a dextral strike-slip fault, and the rocks on the right advanced toward the foreground relative to the rocks on the left. The view direction, along strike, is just east of due north. The shear strain in this ductile shear zone was not uniformly distributed. In particular, bands of phyllosilicates, most notably serpentinite, absorbed more shear strain than did adjacent bands of quartz-rich rock. Black, schistose serpentinite can be seen wedged between quartz-rich gneiss or mylonite vertical layers in this closeup of the Dover fault rock-face pictured and described in the wider-angle view above. The presence of the serpentinite helped relieve shear stress in this region through preferential accumulation of ductile strain. 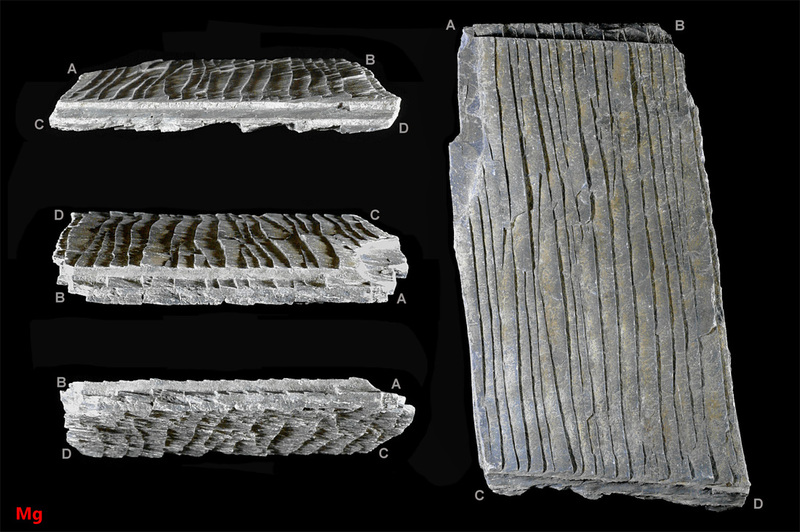 However the mylonite sections were also shear-fractured into multiple thin layers as shown in the specimen illustrated below. The photos above (two views of the same specimen, width 10 cm) show quartz-rich gneiss, low in phyllosilicate minerals, taken from the rock-face illustrated previously. 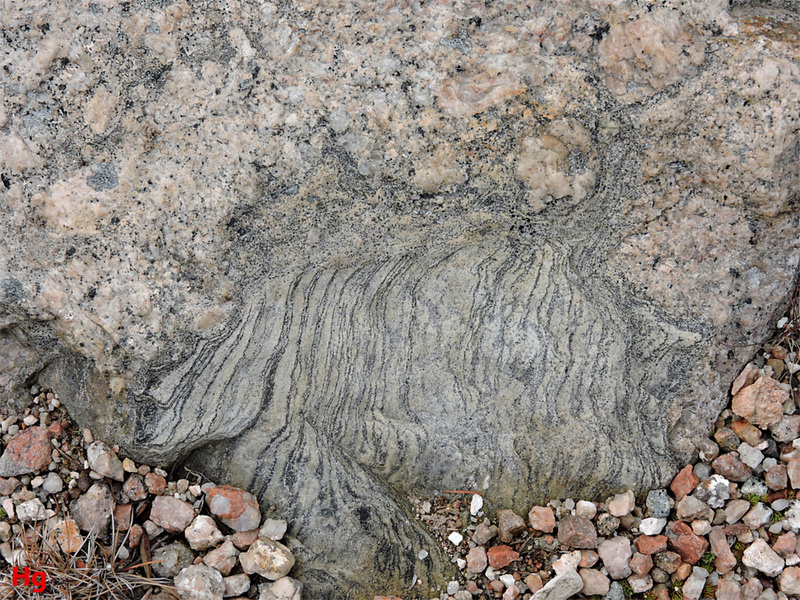 The cleavage induced by shear strain in this rock is evident in the front-on view, but the rock does not separate as readily on the shear-induced planes of weakness as it does along planes of contact with the serpentinite bands. The left-shown surface of the specimen is cleaved primarily along a plane of serpentinite. Conditions of substantial hydrostatic stress and elevated temperature at the Dover fault would tend to oppose development of planes of weakness by shear-fracturing of rock with low phyllosilicate content. 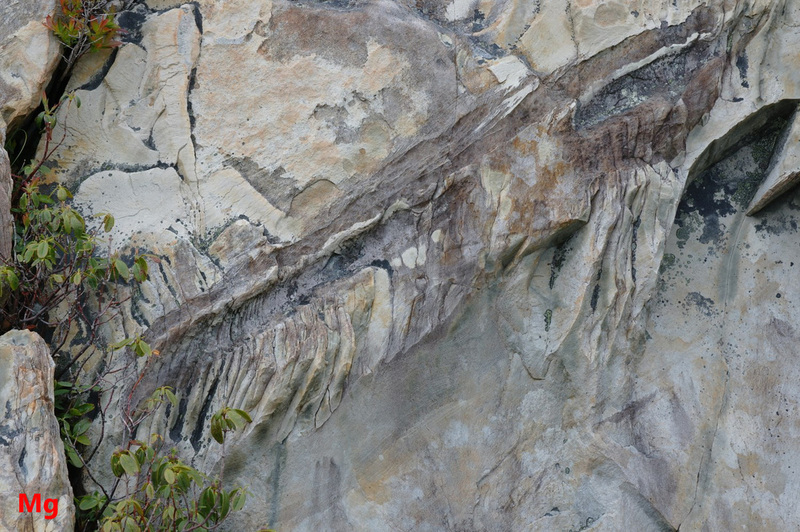 The photo on the left (20 cm length) above shows another specimen of silica-rich metamorphic rock from the ductile shear zone of the Dover fault (same location as pictured previously). 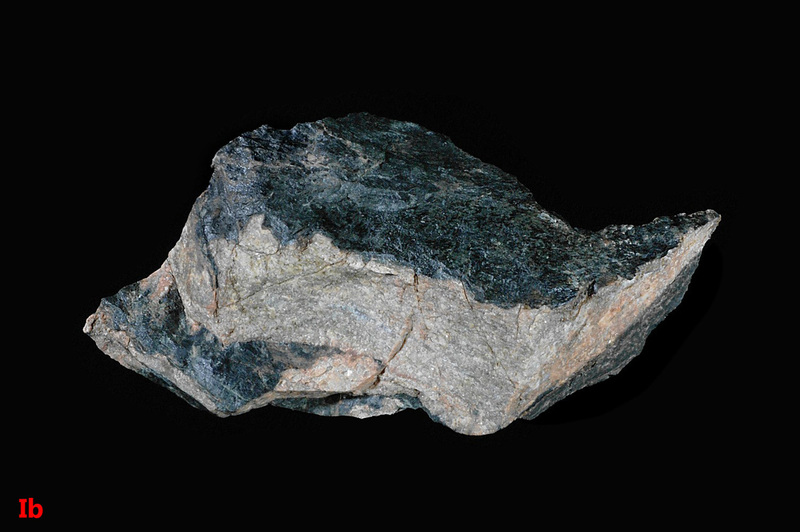 This specimen lacks noticeable cleavage in the gneiss, but is bounded by parallel layers of schistose serpentinite. 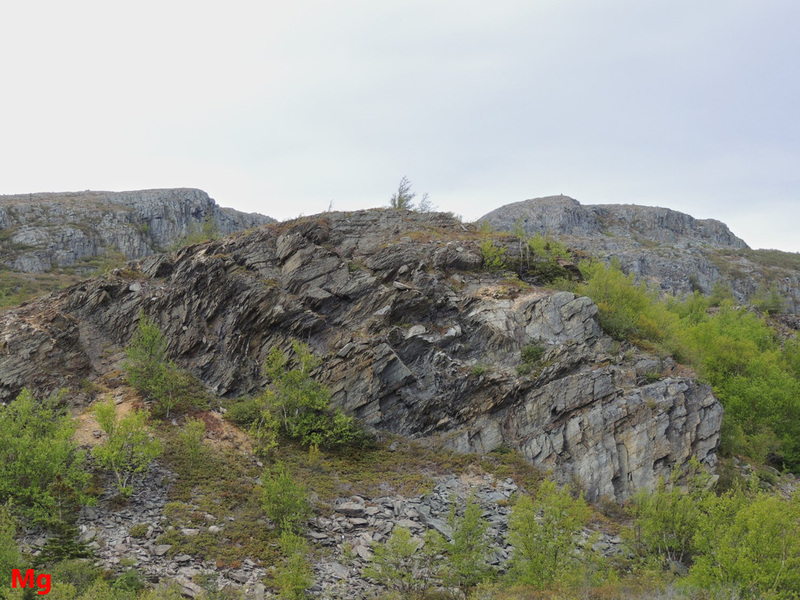 The photo at the right (about 1 m top-to-bottom) is from a different section of the Dover fault, where shear fracture and schistocity are evident in a band of phyllosilicate-rich rock sandwiched between two layers of gneiss. This picture looks straight down on a horizontal ground surface. Generally, the geomorphology of areas along the Dover fault is not as strikingly influenced by shear-induced planes of weakness as might be expected. 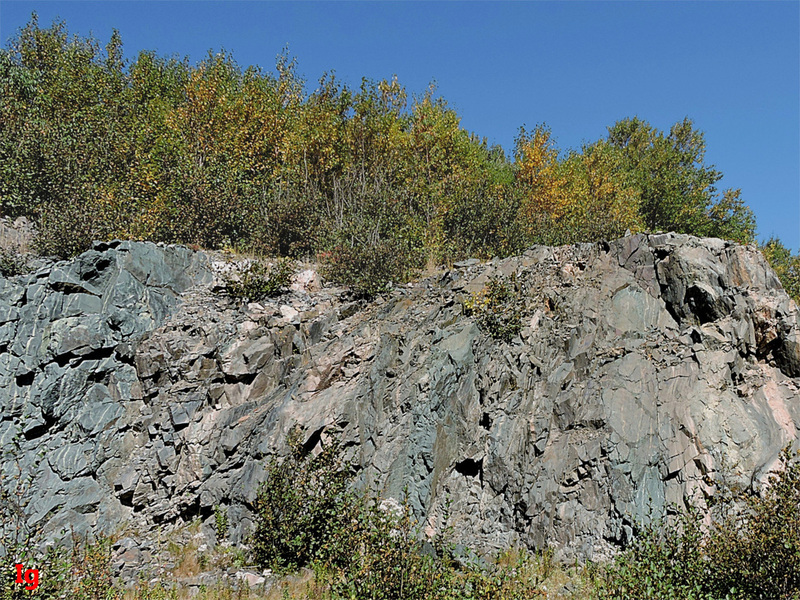 Along the fault trace, there are examples of notable depressions in the landscape where glacial erosion has taken out sections of rock that were shear-fractured or brecciated by strike-slip motion on the fault. However, these features, with widths of the order of a few hundred meters and having sloping forested edges, are not as prominent as more exposed tectonic landforms seen further from the fault where compressional stress was dominant. The south shore of Hermitage Bay runs for more than 20 km directly along the trace of the Hermitage Bay fault. This section of coastline follows shear-induced planes of weakness associated with large-scale strike-slip displacement of rocks on the southwest portion of the Dover-Hermitage Bay fault system. 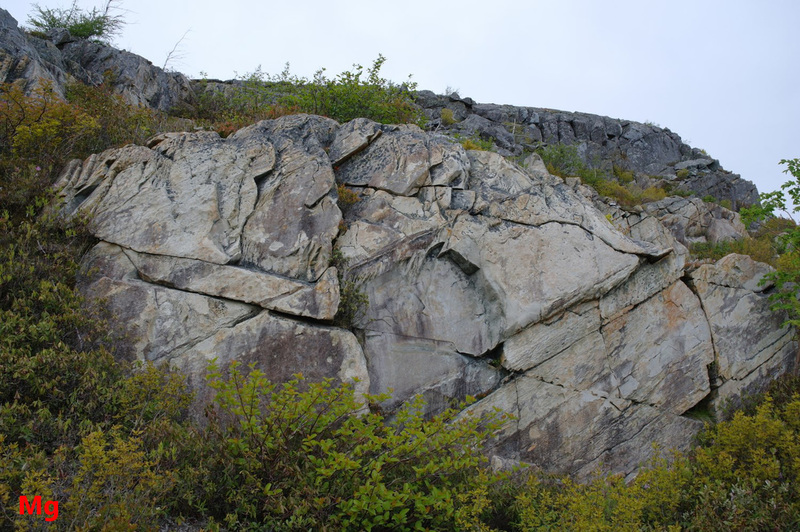 Most of the rocks in Heart of Avalonia have undergone low grade regional metamorphism. However some rocks, for example those very close to the Dover-Hermitage Bay fault trace, have undergone high grade metamorphism where temperature, depth of burial (hence hydrostatic stress) and shear stress have formed mylonites, gneisses and schists. High or intermediate grade regional metamorphism also appears to be present in some rock outcrops 10's of km from the fault trace. 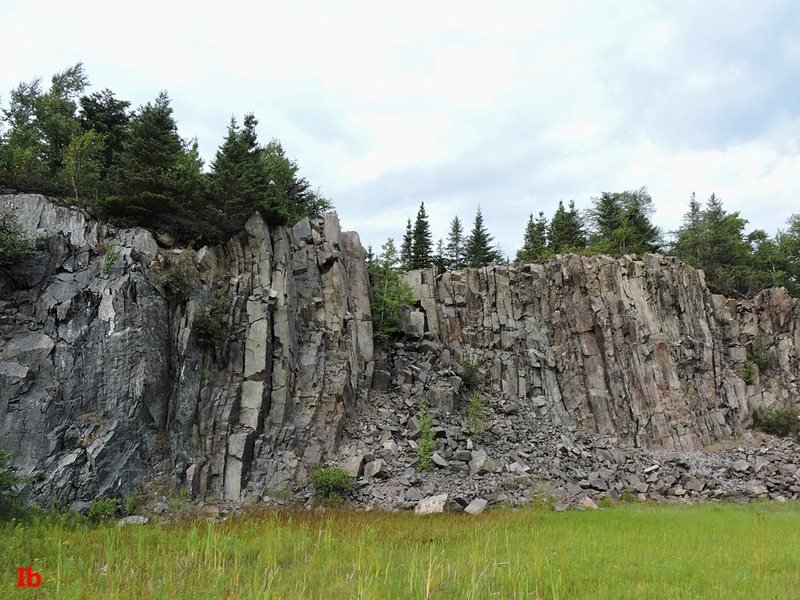 These metamorphic rocks, further displaced from the fault, may reflect proximity to igneous intrusions, particularly the very large Ackley granite pluton, or they may reflect localized high-shear environments. The rock exposure shown left above (closeup of center portion is shown right) is located 30 km from the D-H fault trace and 10 km from the edge of the Ackley granite. Along this exposure are several vertically dipping bands of rock possessing cleavage/jointing that may indicate shear fracture. One such fractured band is shown (center, right photo) above. The joint planes strike 33 deg. E of N. Planes of variation in color and texture of nearby rock closely follow the cleavage planes, with similar strike and dip. 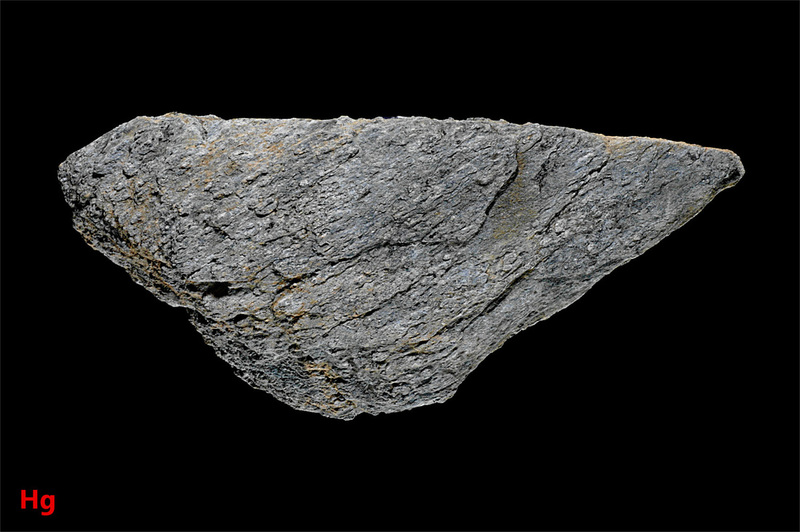 The above-pictured specimen (18 cm width) is a sample taken from the cliff-face immediately adjacent to the jointed rock shown in the previous photo (right). The veins, color bands and the cleaved surface at the right of the specimen all run parallel to the joint planes in the bedrock. The specimen may be a gneiss or mylonite, but metasomatism may instead account for its composition. In this case, the joints might be compressional in origin, with a pervasive tectonic compressional cleavage extending throughout the rock. Fluids following this cleavage could then have altered the rock in a banded pattern resembling shear deformation. Nearby to this specimen, other rocks showed evidence of serpentinization, with thin layers of serpentinite and associated magnetite. Mica schists were also present. 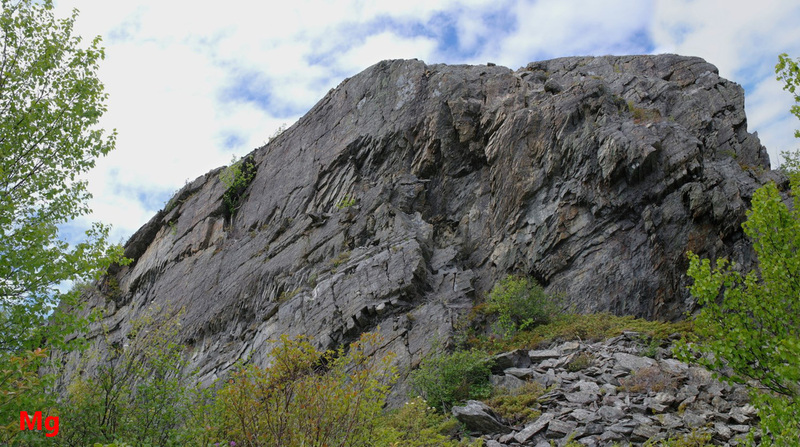 The Ackley granite straddles the D-H fault trace, extending out 30 km into the rocks of Heart of Avalonia. 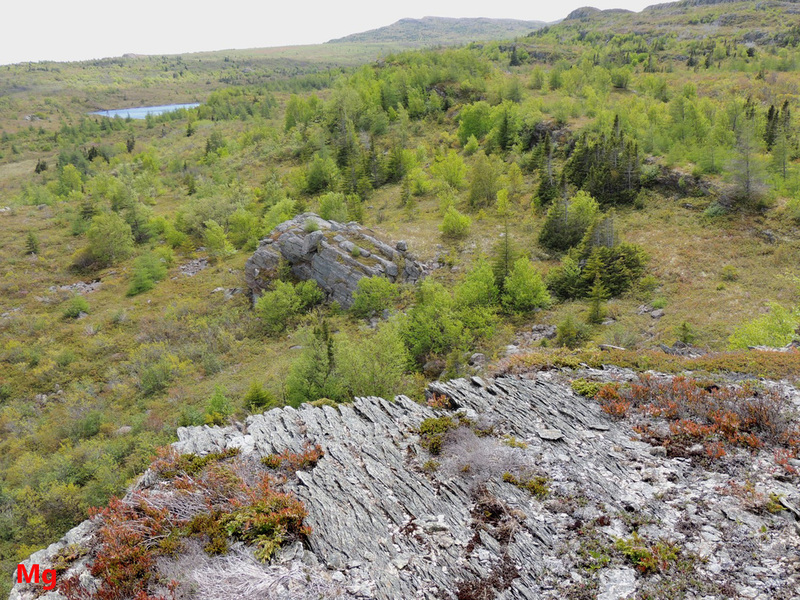 The pluton contacts subaerial volcanic rocks and sedimentary rocks at the northeastern end of the Burin Peninsula and the contact is exposed in bedrock outcrops in some areas. Extensive areas of schistose volcanic rock with abundant quartz veins can be found in a large zone around the pluton, along with phyllites and chlorite and mica schists. This indicates that hydrothermal activity, metamorphism and metasomatism accompanied the emplacement of the pluton. The pluton is younger than the active period for the D-H fault. 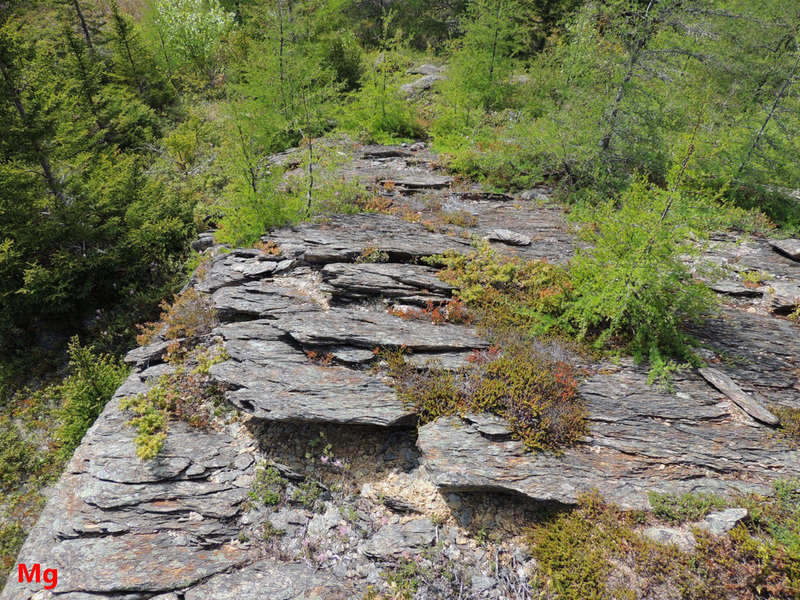 Strong cleavage in rocks near the Ackley granite, and planes of alignment in nearby schists all follow the expected orientation of planes of weakness associated with the D-H fault. The specimen pictured above (width= 15 cm) was taken from the contact of the Ackley granite with adjacent older volcanic rock. The specimen is puzzling in that it resembles mylonite seen on or very near the D-H fault trace, yet was obtained 30 km away from the fault. The rock has a schistose texture, with abundant mica and possesses distinct cleavage as evident from the picture. This cleavage appears to represent shear-induced planes of weakness. The left photo (horizontal rock surface, width: 25 cm) shows schistose volcanic rock less than 10 m from the Ackley granite contact. The pronounced, vertically dipping cleavage strikes 33 deg. 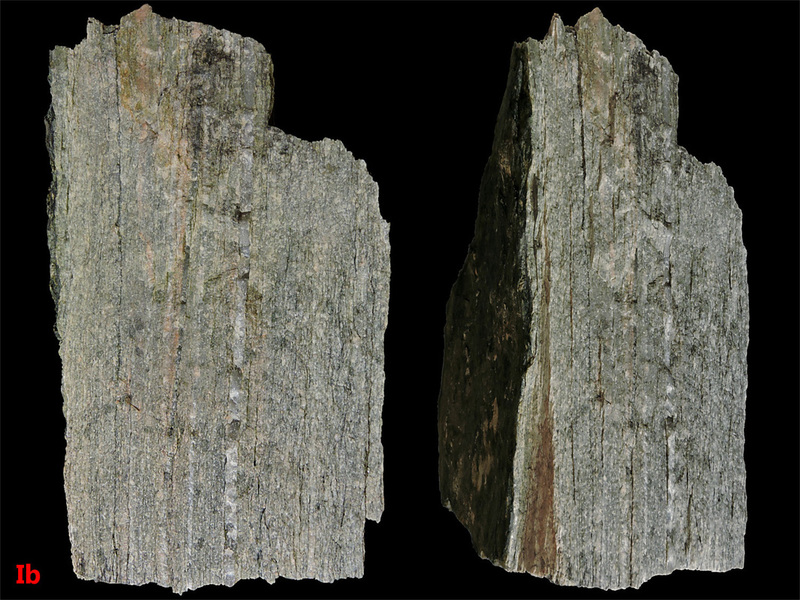 E of N. The right photo is a specimen (width: 19 cm) of nearby rock as shown in the left photo, but shown side-on, with the cleavage planes pointing toward the camera. 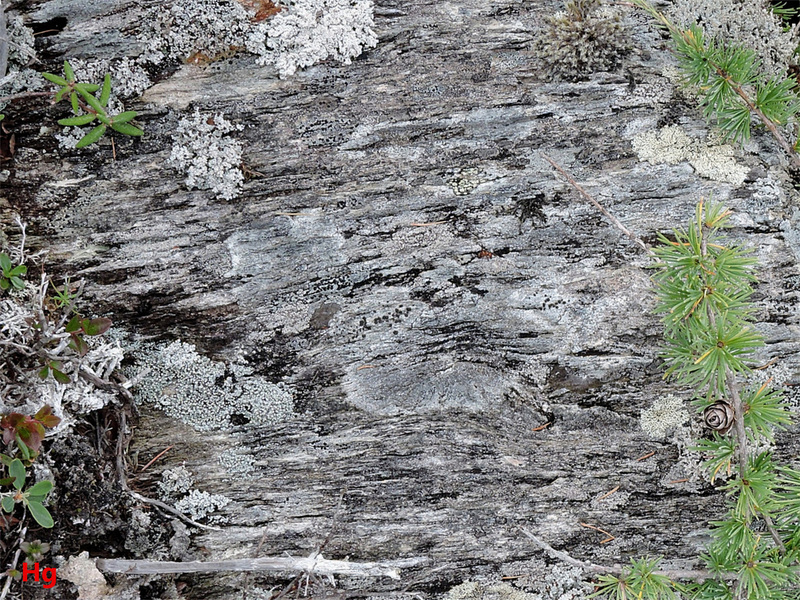 Contact between the Ackley granite and adjacent older volcanic rock is shown in the view of horizontal bedrock above (width of view, left photo: 55 cm). The right picture is a closeup of the right side of the left picture. The volcanic rock, likely having possessed tectonic cleavage before intrusion of the granite, has been deformed by heat and pressure and probably modified in composition by metasomatism. A view of horizontal bedrock (width of view: 80 cm) at the contact between the Ackley granite and adjacent older volcanic rock. The grey volcanic rock looks like it may have been mylonitized by shear forces associated with the intrusion of the pluton. Shear fractures and shear-induced cleavage associated with folds will tend to strike in the same direction as the fold axis. Tilted sedimentary bedding planes on the sides of folds also strike along the fold axis. This can make it confusing as to whether observed planes of weakness are of compressional tectonic origin or whether they were caused by shear or weaknesses between bedding planes. Cleavage and joint features (excluding bedding planes) that have low angles of dip, also features that vary rapidly over small distances, are more likely to be associated with shear. The four photos above show sedimentary rock, alluvial or fluvial in origin and generally fine-grained and composed mainly of clay minerals. In each picture, it is apparent that glacial ice flow has eroded the bedrock, cleaving the rock along nearly horizontal planes of weakness. The erosion surfaces do not exactly match the overall dip of the cleavage planes, leaving the distinctive imbricated appearance of the exposed rocks shown in the photos . 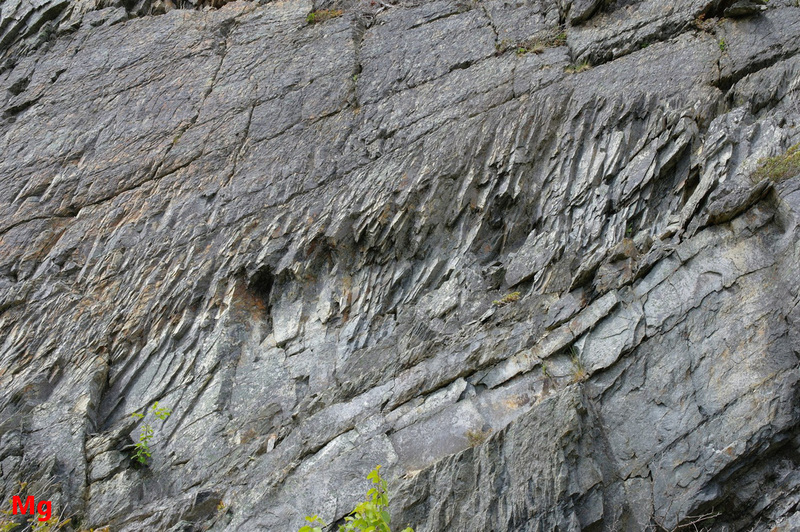 The low dip angles of the cleaved surfaces and the absence or misalignment of bedding planes suggest that the cleavage was caused by shear stress associated with folding. The shear stress acted either to produce aligned shear fractures in the rock or else to promote development of layered planes of oriented phyllosilicate crystal grains. Tectonic cross jointing is visible in the top left photo and, to a lesser extent, in the bottom left photo. The bottom right picture shows a glacially carved outcrop in the background (center of photo) exhibiting low-angle joints and failure surfaces that are aligned in a similar direction to the shallow-dipping cleavage surfaces seen in the foreground rocks. 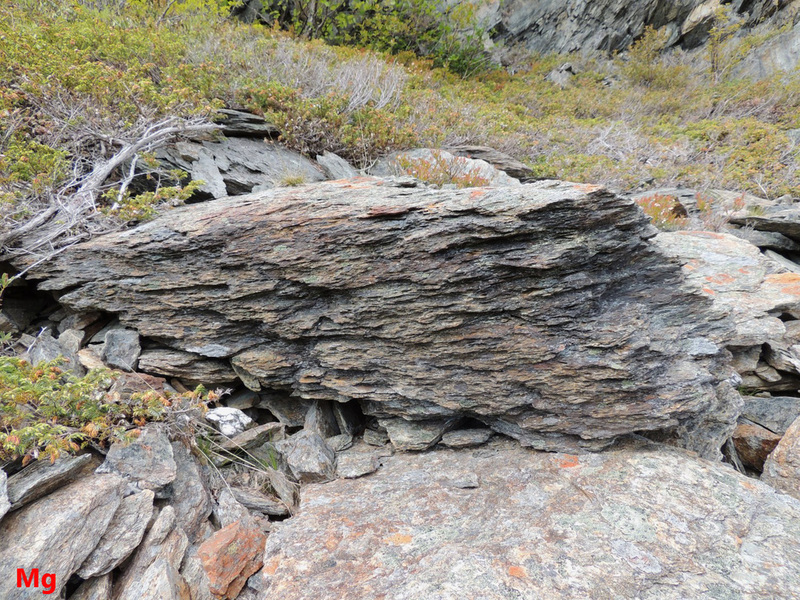 This picture shows a section (outcrop is about 5 m high) of a fold in alluvial sedimentary rock that was cut by glacial ice moving left to right and toward the camera. The failure plane facing the camera corresponds to a cross joint and is approximately normal to the axis of the fold. The joint set seen dipping at about 30 degrees and roughly paralleling the top of the feature corresponds either to bedding planes​​ or else to tectonic shear fracture. The results of additional, more complex shearing of the rock are seen in joint patterns on the side of the feature and in the frost-weathered cavity, from which fell the associated pile of broken rock. ​The two frames above are details of highly sheared regions from the outcrop pictured previously. 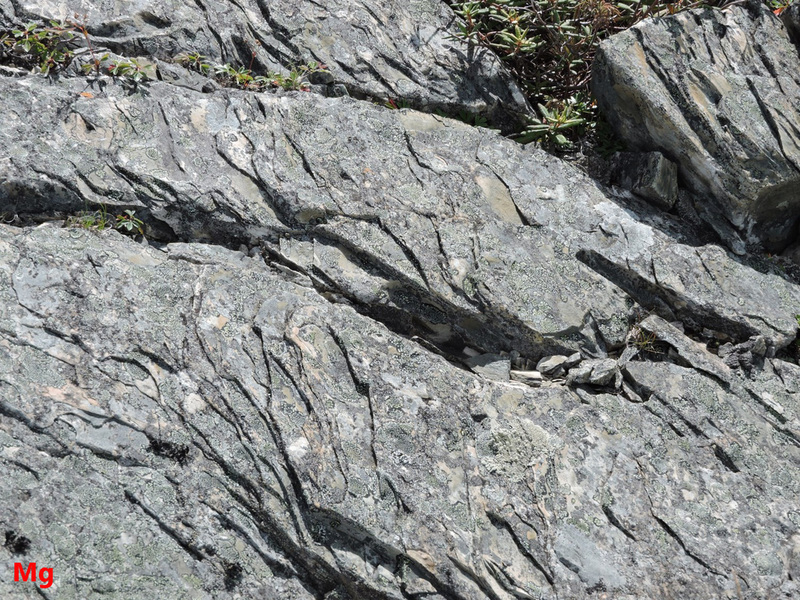 The intense jointing appears to be the result of less resistant beds of rock absorbing larger amounts of shear strain during folding than did the adjacent layers of stronger rock. In the foreground outcrop of glacially shaped and frost weathered alluvial sedimentary rock (about 4 m high) tilted parallel bedding planes lacking pronounced cleavage are seen lower right. These beds are overlain by a region (middle left) where the cleavage is distinct and nonuniform, indicating shear strain. The color of the rock changes between the highly jointed (shear strained) and less jointed beds, suggesting that a change in composition of the beds is responsible for a preponderance of shear strain being absorbed in the upper portion of the feature. The contact between the differing beds may be a fault. 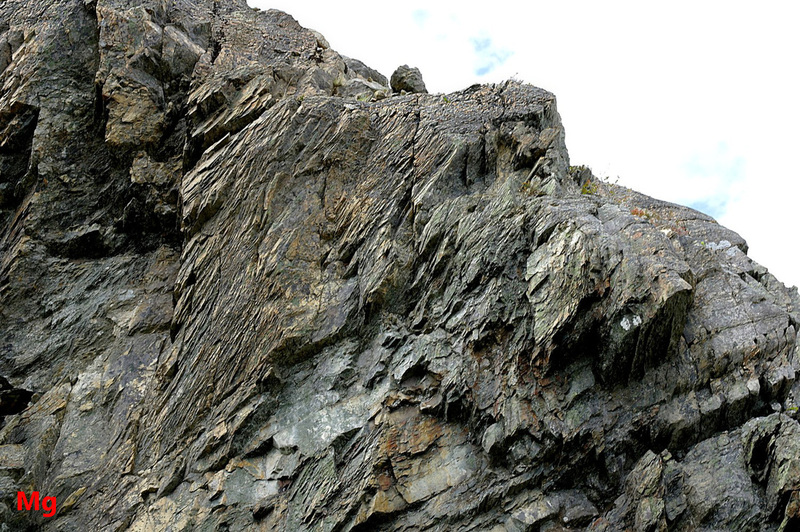 The outcrop of fine-grained alluvial sedimentary rock shown in the above (larger) photo is about 2 m high. The prominent longitudinal joint set seen dipping at about 30 degrees appears to follow weaknesses between bedding planes. These joints may, in fact, be faults or shear fractures. The region highlighted in the two lower photographs shows evidence of a fault bounded by zones of ductile shear strain, possibly occurring in a layer of sediment enriched in phyllosilicate minerals. 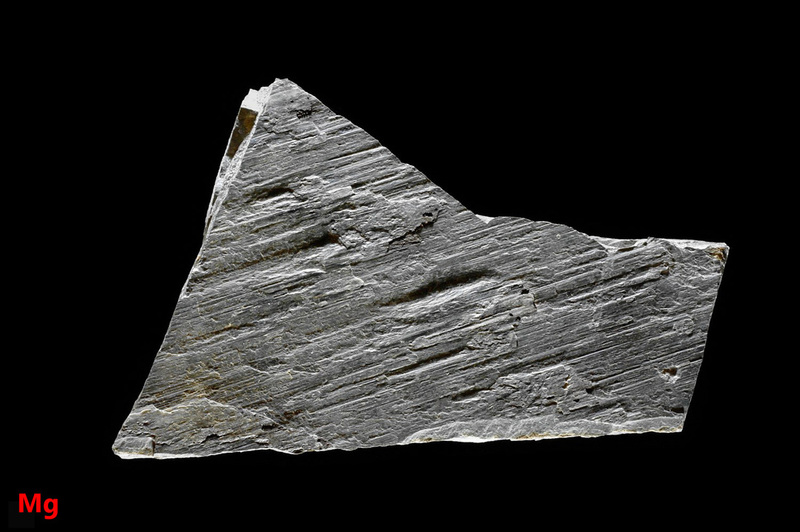 The specimen shown above is a rectangular slab of rock (length=26 cm, width=14 cm, thickness=1.5 cm) representing the Mistaken Point formation (shallow-marine siltstone). The letters shown at the corners indicate matched reference points for the different views. This 3-layered rock slice was subjected to tectonic shear stress leading to phyllosilicate crystal alignment in the top and bottom layers and consequent platy cleavage. 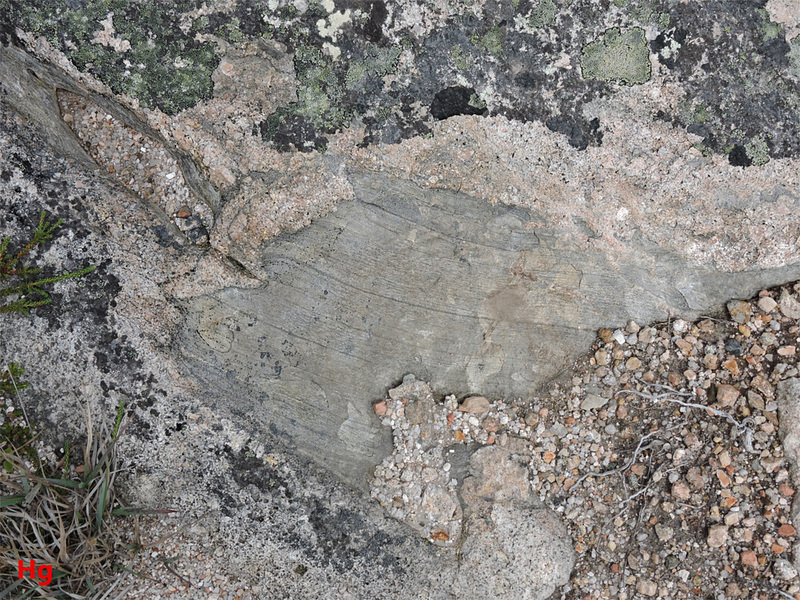 At the place where this sample was taken, other nearby specimens showed slickenside markings indicating brittle failure of adjacent rock layers due to shear stress. In the right-hand view and in the top left view, a middle layer of darker rock lacking cleavage is visible. This layer is a bed of sediment lacking phyllosilicates and may be volcanic ash that settled through the water column. 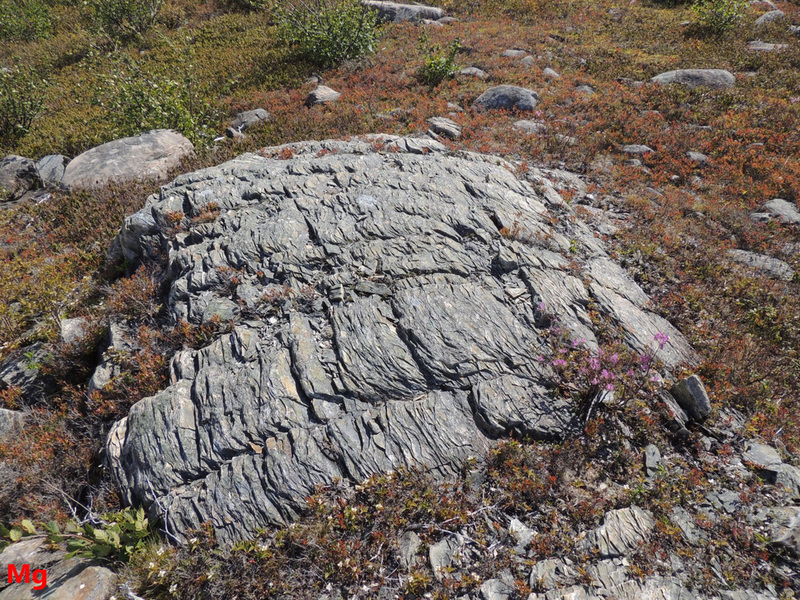 The shear-induced cleavage was very close to being parallel with the bedding, but nevertheless not exactly aligned, giving the specimen the peculiar shingled appearance. The piece is held together by the center layer. The underside of the specimen is visible in the bottom left picture. 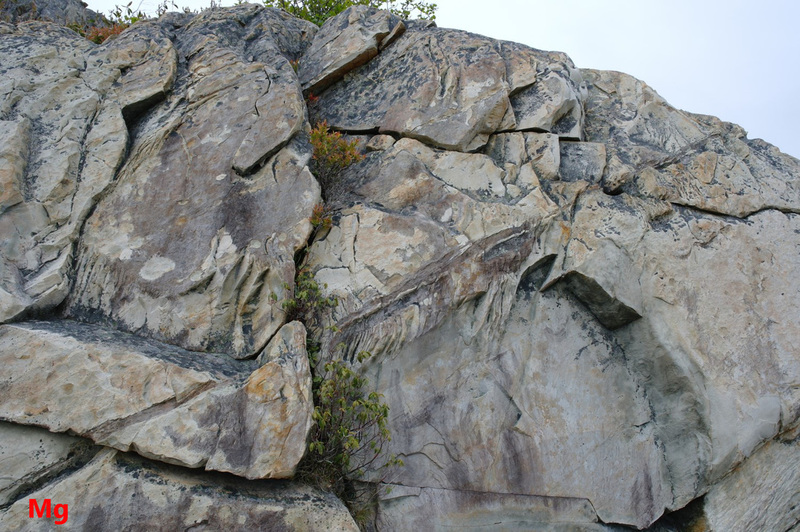 While some beds from the Mistaken Point formation are known to possess Ediacaran fossils, regional metamorphism works against their being observed in beds such as are illustrated above.